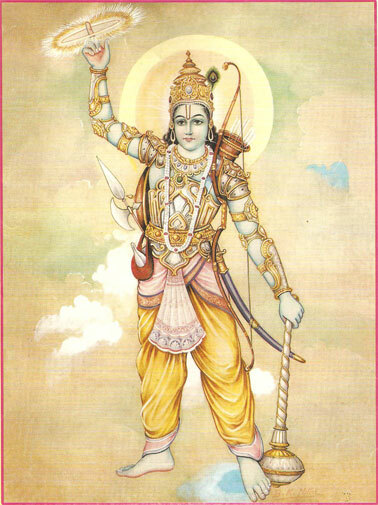 In tenth pAsuram, AzhwAr becomes distressed thinking “How is this internal vision occurring which affects my joy of being forgetful of him when he is not seen physically?”. Subsequently, AzhwAr says “When I desired to see emperumAn who is known from vEdham, with his divine hand and chakra, and did not get that physical vision, should he shine in my internal vision, making it impossible for me to forget him and sustain myself?”. aNNalE – Oh my lord who enslaved me! thazhuvuvan – will embrace him. Saying “Oh my lord who enslaved me by manifesting the beautiful combination of your divine hand and the chakra!”, falling down on the ground and having overflowing tears, I remained anguished; I who am a sinner, was unable to see him; with my matching gyAnam as the [internal] eyes, I will embrace emperumAn who is the natural embodiment of boundless knowledge and is seen through the lamp of vEdham. As the love became the cause for anguish due to not being able to see him, the internal shining wisdom also became the cause for anguish. chakkaraththaNNalE enRu thAzhndhu – Falling on the ground saying “Oh lord who enslaved me showing your divine chakra!”. kaN nIr thadhumba – To have overflowing tears in the eyes. The limit of AzhwAr’s sorrow is known from his tears. pakkam nOkki ninRu alandhEn – Looked eagerly at the direction from where he is likely to come and became vexed [due to his not coming]. As described in vishNu dharmam 68 “paramApadhamApanna:” (fell in great danger). pAviyEn kANginRilEn – Though in great danger [deserving to be helped by him], since I was a great sinner, I did not get to see him. Though I am unable to see him, did I at least become saved by forgetting him due to his not shining in my heart? mikka gyAna mUrththiyAya – one who is the embodiment of complete knowledge. vEdha viLakkinai – One who is seen through the lamp of vEdham; also explained as – one who is revealed in vEdham. en thakka … – Matching my nature, I will have an internal vision and through that I will see emperumAn and enjoy him. As the love became the cause for anguish due to not being able to see him, the internal shining wisdom in the heart also became the cause for anguish. The gyAnam (knowledge) and bhakthi (devotion) explained in thiruvAimozhi 1.1.1 “mayarvaRa madhi nalam aruLinan” (emperumAn blessed faultless gyAnam and bhakthi), became the hurdles themselves. AzhwAr says “Do I even need this knowledge which matches my stature, which stops me from forgetting him and sustaining myself?”. This entry was posted in thiruvAimozhi, thiruvAimozhi 4th centum on March 24, 2017 by Sarathy Thothathri.